Atomic coordinate files are the data files that specify three-dimensional (3D) molecular structures. At a minimum, they must specify the positions of each atom in space, typically with X, Y and Z Cartesian coordinates, and the chemical element each atom represents. Atomic coordinate files use many possible data formats. The XYZ format (file type .xyz) is specifies only the coordinates and chemical element for each atom, and is useful for small molecules. This format is not adequate for macromolecules because additional information is needed for their atoms. Macromolecular atomic coordinate files need to specify quite a bit of information in addition to the position of each atom in space and its chemical element. Each atom either belongs to a Standard Residue or not. If not, it is designated a hetero atom. The position of each atom within a standard residue is specified, e.g. carbon atoms in amino acids can be the carboxy carbon (C), the alpha carbon (CA), the beta carbon (CB), and so forth. Nitrogen atoms can be in the main chain (N), or on the sidechain, e.g. in the terminal zeta position in lysine (NZ). In addition to the name of the residue to which an atom belongs are provided the name of the chain where the residue is found, and its sequence number position. In addition to the X, Y, and Z coordinates are given an occupancy value, and an isotropic B value or temperature value''. The most popular macromolecular data format among crystallographers is the one developed and used by the early (1970's) Protein Data Bank, called the Protein Data Bank Format, PDB Format, or legacy PDB format. Data files in this format are called PDB Files (file type .pdb). Although this format has serious limitations, it remains popular partly because the data files are in plain text, and are relatively easy to read by humans. 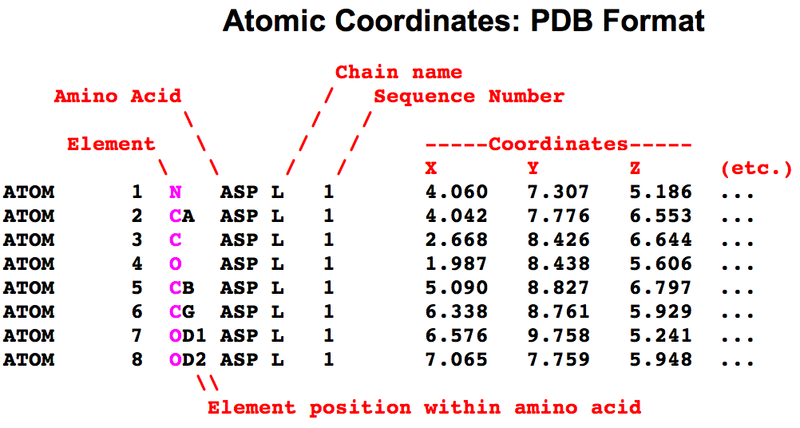 Simplified Diagram of ATOM Records in the PDB Format. Not shown (under etc.) are the occupancy and temperature value. ENLARGE. To view a PDB file from a PDB code-titled page in Proteopedia, click on the OCA link beneath the molecule. At OCA, scroll down to the Data Retrieval section, and click on complete with coordinates in the first line there. To view the text of a PDB file at the RCSB PDB, go to the page for the PDB identification code of interest, then at the upper right, click Display Files, and under that heading, PDB File. In February, 2019, the PDB announced that new depositions must be in the mmCIF format beginning July 1, 2019. The PDB expects to retire legacy PDB format files by 2021, in part because all 3-character ligand (chemical component identifier) codes will have been used. The PDB sometimes refers to the mmCIF format as "PDBx", which should not be confused with the original legacy PDB format. In response to the inadequacies of the PDB data format, the International Union of Crystallographers and the World Wide Protein Data Bank have adopted the macromolecular crystallographic information format (mmCIF) as their primary data format for macromolecules. mmCIF is also sometimes referred to as PDBx (not to be confused with the PDB format). While the mmCIF/PDBx format has considerable merit from the perspective of computer scientists, it is unpopular with crystallographers, who prefer to work in the PDB data format. Therefore, the PDB has maintained the entire database in both formats. However, new depositions must be in the mmCIF format beginning July 1, 2019, and it is anticipated that the PDB format will be phased out, of necessity, in 2021. Models with >99,999 atoms, or >62 chains, do not fit in the PDB format (see Jmol/Visualizing large molecules). Such models are available only in mmCIF format, and not in the PDB format. The US National Center for Biotechnology Information (NCBI) maintains a macromolecular structure database (derived from the Protein Data Bank) that is integrated with their Entrez cross-database search system, and their other databases of sequences, medical literature, inheritance, taxonomy, etc. They have chosen to maintain their atomic coordinate files in the Abstract Syntax Notation One (ASN.1) data format. Typically, atomic coordinate files do not specify covalent bonds between atoms. Molecular modeling or visualization software determines the positions of covalent bonds using simple rules. Typically, any two non-hydrogen atoms within 1.9 Ångstroms of each other are deemed to be covalently bonded. (The distance for a bond involving a hydrogen atom is less.) The PDB data format requires that covalent bonds be specified between atoms that are not members of Standard Residues in protein or nucleic acid chains. These are specified in CONECT records. ↑ 1.0 1.1 1.2 Mandatory PDBx/mmCIF format files submission for MX depositions: posted on the PDB email list Feb 20, 2019 by Jasmine Young, Biocuration Team Lead, RCSB PDB. The wwPDb website also posted this document. This page was last modified 19:03, 18 April 2019.